The final book in a trilogy, Clockwork Princess follows the story of teen warlock Tessa Gray. Tessa is engaged and ready to be married to her love, Jem Carstairs. Unfortunately, Tessa is still being stalked by a madman named Mortmain intent on destroying all Shadow Hunters. Tessa has an ability that is key to his victory, and he will stop at nothing to harness her powers. Tessa does not fully understand what her powers are and struggles to stay out of his evil clutches. When Mortmain buys out the only supply of the precious yin fen drug that is the lifeline of her beloved fiancé, Tessa is forced to make a difficult decision. Her decision is further complicated by her requited love for Jem’s best friend, Will Herondale. Both boys love her equally and are sworn to protect her. Both are willing to die to keep her safe, and Tessa tries bravely to keep them out of harm’s way. Her choices affect not only herself, but generations of future Shadow Hunters. 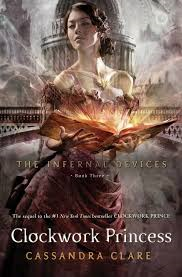 Clockwork Princess is the last installment of Clare’s Infernal Devices series. This book precedes City of Bones chronologically, and has clear ties to the events and characters portrayed in the Mortal Instruments series. Some characters, such as Magnus Bane, Tessa Gray, and Brother Zachariah actually make appearances in both book series, as they are immortal and their lives span over generations. Clare very cleverly links the two series and gives a broader picture of Shadowhunter genealogy and history. I personally preferred Clockwork Princess to City of Bones for a number of reasons. The character of Tessa is not nearly as frustrating as the character of Clary, though she is equally as self-less in her decisions and actions. The love triangle is very similar to that portrayed in the other book, but its outcome is entirely different. One could argue that the ending of Clockwork Princess is too convenient, and to some extent I have to agree. Reader’s Annotation: Most people are lucky to find one true love. Tessa finds two, and they will stop at nothing to keep her safe from a looming danger. Cassandra Clare, best known for The Mortal Instruments series and The Infernal Devices series, has lived all over the world. Born in Iran to American parents, she has traveled the world and lived in countries such as France, England, and Switzerland. She currently lives in the United States, and is a full time fantasy fiction writer. Her first published book was, City of Bones, part of The Mortal Instruments series, in 2007. It was adapted into a movie in 2013 and the series will be adapted into a tv series that is set to air in 2016. Describe Tessa’s power to shapeshift into other people. Describe an encounter with an automaton.